Many years ago, when I had just started turning, I visited a one-man exhibition by a turner who has now become a great friend, Tim Lawson. I was instantly struck by his work; the scale and size of it was greater than I had ever seen and the proportions were brilliant. There was something about the pieces, even the smaller ones. They all had presence and all said "Look at me, touch me." It is something I wanted to instil in my work. 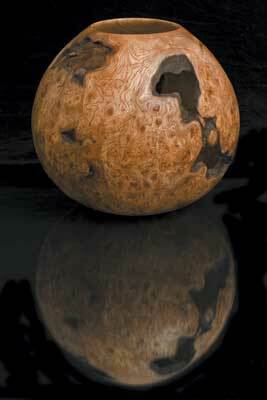 Having spoken to Yorkshire-based woodturner, Phil Stevenson, I am sure he feels the same way about his work. Phil likes to work on a grand scale. 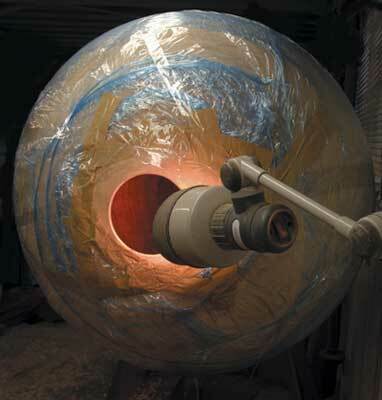 There are several reasons for this, he tells me: "I like the challenge - to push the boundaries to see if it can be done and to invent or adapt tools and my lathe to make it possible and safe. There is also the relationship that the finished piece has with the viewer. "As human beings we occupy a certain amount of space, we relate to things in the world, always with ourselves as a reference point. When we enter a magnificent building and look up at the cavernous space above, it makes us feel smaller than we did before and totally in awe of man's achievements. Likewise with my large work; I aim to inspire a kind of wonder. I want to create things that have a presence in a room and make no apologies for their size or weight." Phil works in the IT industry, managing the needs of a small company. This is a part-time job for him now and he hopes to be able to stop completely later this year to concentrate fully on his woodturning. Like so many of us, his first introduction to the craft was when he was at school at the age of 14. He obviously showed an aptitude for woodwork and, after finishing a project ahead of his classmates, his teacher Martin Scott showed him how to use the lathe. "I had never used a lathe before or even seen one working, but the machine held a fascination for me," he says. "Mr Scott screwed a piece of mahogany to a faceplate and showed me how to get started." 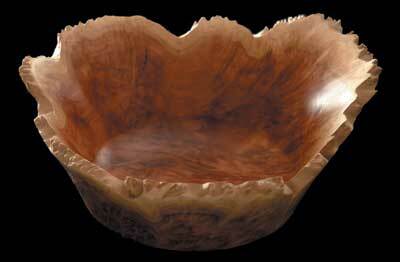 Phil remembers that he was not allowed to use the bench grinder, so he continued with blunt tools to shape a small bowl that he still has today. 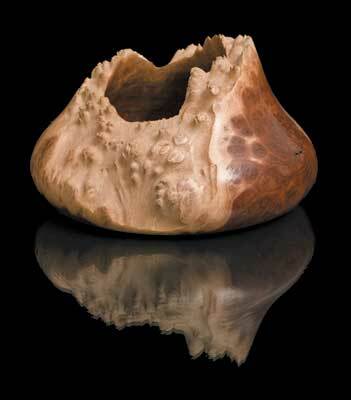 He also remembers that the piece looked smooth when it was revolving on the lathe, but when he stopped the piece, "It took on the appearance of something that had been chewed by a large dog! A considerable amount of time and abrasive paper was required to achieve the finished piece." This was Phil's one and only flirtation with turning until seven years later. And he probably would not have returned to the lathe then had it not been for a serious back injury that put a halt to his busy schedule of squash, cycling, running and other sporting activities, leaving him with time on his hands. By chance he found an advertisement for a lathe and a few tools. He bought it and passed many a happy evening in his father's garage. "This was a huge learning curve for me," he says, and then quips: "But you tend to learn quickly when lumps of wood fly off and hit you at great speed." 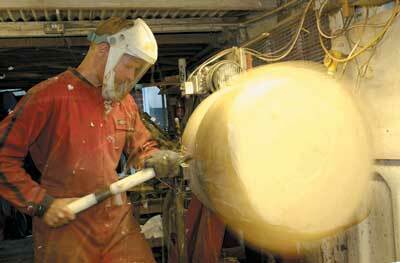 From the outset, Phil's preference was to turn large pieces and he soon outgrew the usefulness of this first lathe. He bought another, but this didn't last much longer - after a few months he had damaged the shaft. Phil hankers after a VB36 which, he believes, will be enough to cope with the work he produces. Unfortunately this lathe was not on the market back then so he decided to build his own. This is a huge machine, driven by a 5.5HP motor, geared down to run at the slow speeds necessary for his large work. 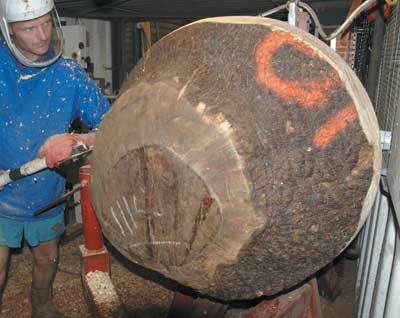 He has turned a large madrone burr initially weighing 1,114lbs on it and told me that the lathe coped admirably. Phil has been successful selling his work for some years. He told me that a couple of galleries have been selling it steadily for some time now, but more recently he has taken stands at craft shows. He says that these have become great fun, although they are not easy when you have to take most of your annual leave entitlement to cover them. This parallels exactly what I did, before I became a full-time turner, so I can relate to it well. Phil and his wife, Helen, like to be able to talk to their customers directly and it is a great way of eliciting the views and reactions of people to your work. "Seeing people's first reactions to my work can be wonderful thing: a lady comes around the corner at a craft show and suddenly sees one of the huge round forms, she rushes towards it arms outstretched as if greeting a long-lost friend beaming from ear to ear - or a more restrained gentleman sidles up to the stand, hands behind his back, when quickly the urge to lean over and peer inside the small opening in the large tear drop form grows too strong and, as if looking for treasure or answers to unasked questions, he gazes into the opening. "I have been tempted to place something inside for such encounters, a written greeting or maybe two small eyes to gaze back, but so far I have not given into this mischievous urge." I was told a long time ago by an old professional turner that the bigger the piece of turning you are trying to sell, the smaller the market. Phil has also encountered this problem. "Unfortunately, the downside when trying to sell this extra-large work is that many people say they would love to buy it, but don't have the room - maybe I will go into designing big houses next." I asked him whether he was influenced by other turners' work, or whether he admired any creations by others. 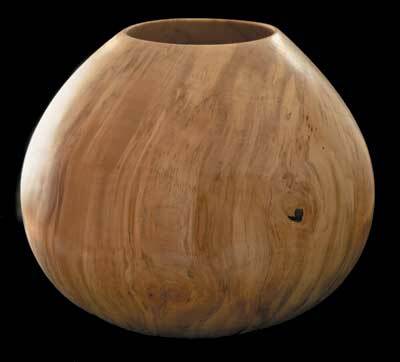 He told me that he tried not to be influenced by other turners and deliberately does not go looking for their work: "I would prefer to get my inspiration from the wood rather than other work," he says. 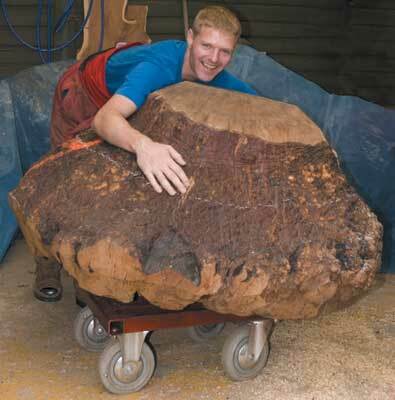 Phil loves working with the exotic, heavily figured timbers. 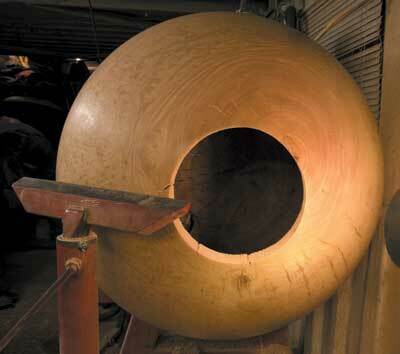 "For me, there's nothing better than to stop the lathe halfway through roughing out and seeing the magnificent piece of tree that's been revealed. "This is the inspiration I need and when the design process really kicks in. How to maximise the features and eliminate any faults. How to create a pleasing form that is in proportion and balance within these constraints." Last year Phil imported a huge crate of timber from a well managed source in Australia. "When I opened the box, it was like all my Christmases had come at once," he enthuses. Included in the shipment were some pieces of red mallee. "It's one of the most beautifully figured timbers that I have ever seen and strongly recommend that any of your readers try a piece if they haven't already." He is halfway through this crate and tells me that he wouldn't hesitate to order another one in the future, so pleased was he with the shipment. Phil has a very busy year ahead of him. He has bought a plot of land in the north of Wales and is planning to build a house and workshop there. Once this is complete, he intends to concentrate purely on his craft. Phil is clearly passionate about turning and his work. 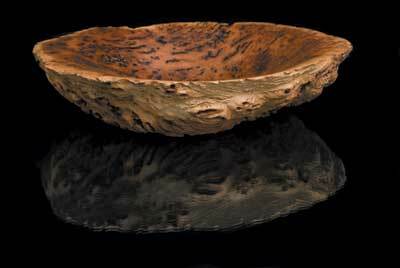 He told me that, in addition to the scale of the work, another key aspect for him was that the finished pieces keep some relationship going with their natural beginnings as living, growing trees. "I avoid highly polished wax finishes and stick with the softer sheen of oil. The occasional hole where a branch emerged or where a rough bit of bark is left on are a reminder that this material is natural and has been a long time in the making." He is excited and almost poetic about the natural material we all use. "Also the movement of the wood after turning is testament to the fact that this natural product is not totally tamed by my hand. 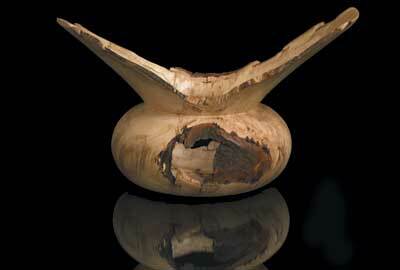 "Obviously an unexpected split can render the piece not fit for sale, however when the wood is kinder and it just gently pulls around a knot this can become a beautiful feature." I believe Phil has a great woodturning future ahead of him. I am sure we shall be hearing more from him and I, for one, wish him all the best in his turning career. "I want to create things that have a presence in a room and make no apologies for their size or weight"